Place the water, sugar, cinnamon stick, zests of orange and lemon in a casserole type pan and simmer until the sugar melts. Warm the olive oil in a deep casserole over medium heat and brown the semolina, stirring with a wooden spoon, for 6 minutes until it turns dark brown. 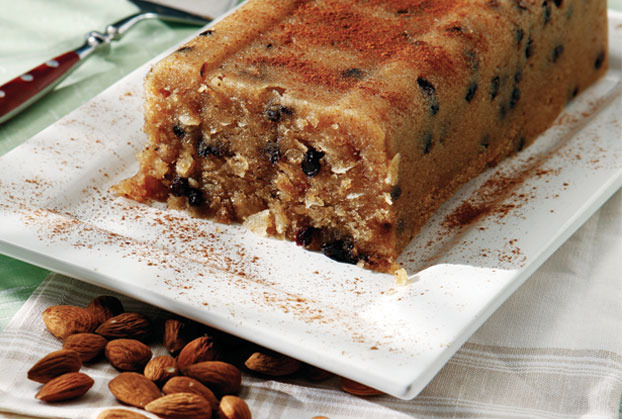 Add the cinnamon powder, raisins and almonds, stir and remove from heat. Use a ladle to pour, carefully, a little at a time, the syrup over the semolina mixture. Be careful because the mixture is very hot and bubbly. Put back to heat and stir until the mixture comes easily off the sides of the casserole. Empty the mixture in a sponge cake mould and leave to cool completely. Turn it out on a large serving plate and sprinkle with cinnamon. Cut in slices and serve.